Leo Fitz: Tell me that you're not Hydra. Leo Fitz: I know that it's ridiculous, but I just need to hear you say it. Jemma Simmons: I'm not Hydra. Leo Fitz: Yeah, good. Good, 'cause I'm not either. Jemma Simmons: Of course not. Leo Fitz: I don't know what I would do. Jemma Simmons: You'll never have to find out. 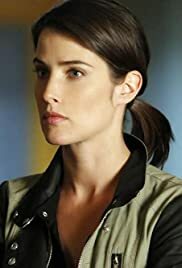 Shield brings back a fan favorite this episode, Smulder's Maria Hill. She helps out the team the best she can to defeat Ward and get Skye back, and that sort of works out. The rest of the team finds out that Ward is Hydra this episode and it got some unexpected reactions, especially Fitz who freaked out the most. I'm glad they learned quickly too because now they are up to speed on basically everything. Coulson going to save Skye on the bus was pretty fun, especially their escape in Lola. Hill was great this episode too, especially her big hint to Man- Thing, cause they can make a great movie with that. She had a pretty big role this episode as she brought the US military and Talbot to the secret base, still sporting a terrible fake mustache. I liked how she helped Coulson out of that situation too and that he told Coulson that taking down Ward and Garrett isn't official, it's revenge. It was also huge to reveal that Coulson was behind Tahiti, as shown by the video that May found. This raises huge questions as to why Coulson wanted it shut down, and why it wasn't, most likely to keep the blue alien alive. I have to say that Deathlok still looks really bad. I like Richard's Mike Peterson a lot but he just looks terrible.